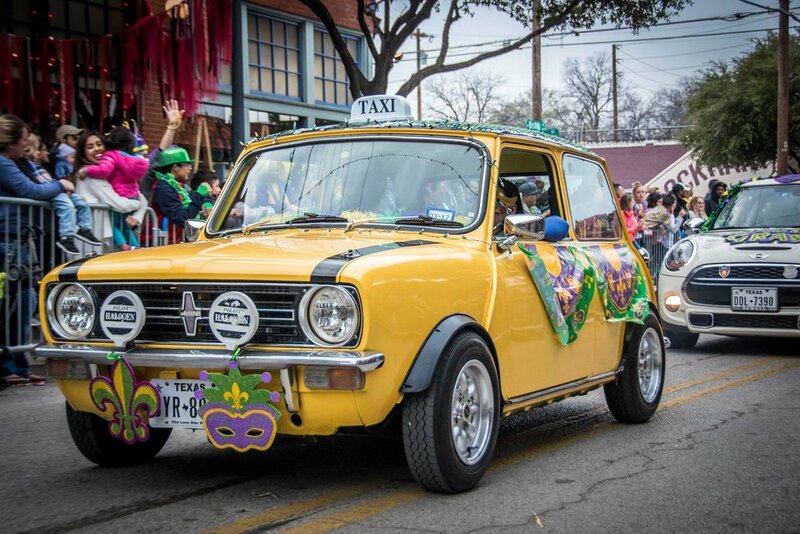 A spring festival and parade celebrating Mardi Gras with an Oak Cliff twist. 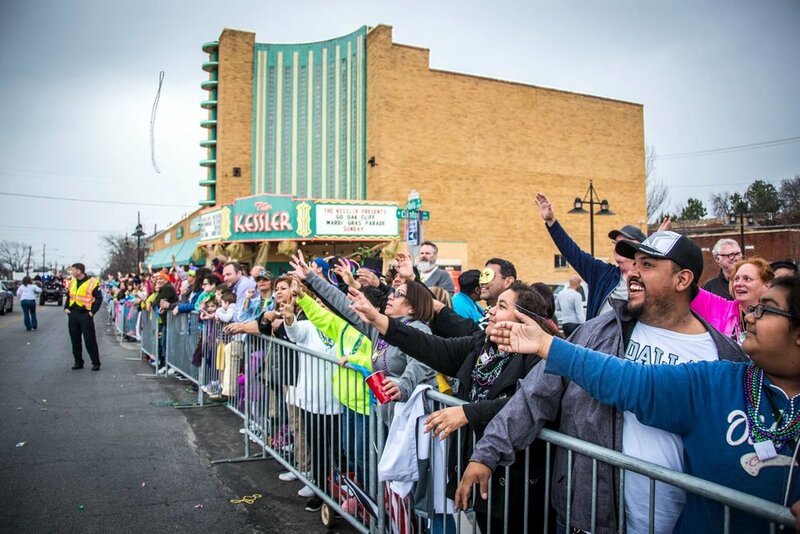 The 2019 Mardi Gras Oak Cliff parade is Sunday, March 3, beginning at 4:00 p.m. CST. The parade route runs along Davis St. into the heart of Bishop Arts. Public transportation, shared rides, or your bike all reign supreme but parking is available on any side streets that aren't permit-only (most of them are okay, except certain streets closer to Bishop Arts). We are proud to welcome back Heritage Oak Cliff, who will once again be crowning the top parade entry. The winner will be announced online, no later than Monday evening, March 4. The themed evening begins with a costumed sit-down dinner with an open bar, backed by brass bands and other entertainment. A traditional second line will transition the night into a late evening dance party. The Dash for the Beads has three designed runs: a mile walk/fun run, a 5k race, and a 10k race. Prizes are awarded for best-dressed walker, runner, pet (that’s right, pet), and more. Awards are presented to top performing men and women in each age group. See dashforthebeads.org for more details. 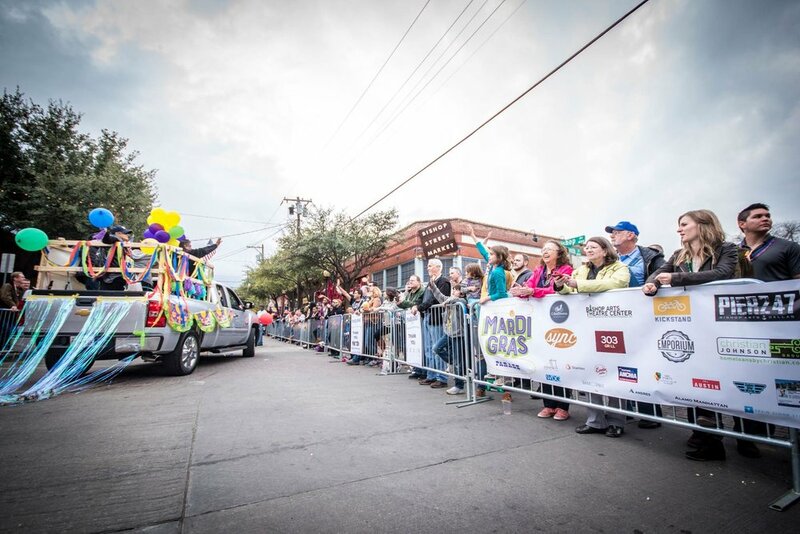 The Mardi Gras Oak Cliff parade is the largest and most diverse event held in Oak Cliff. 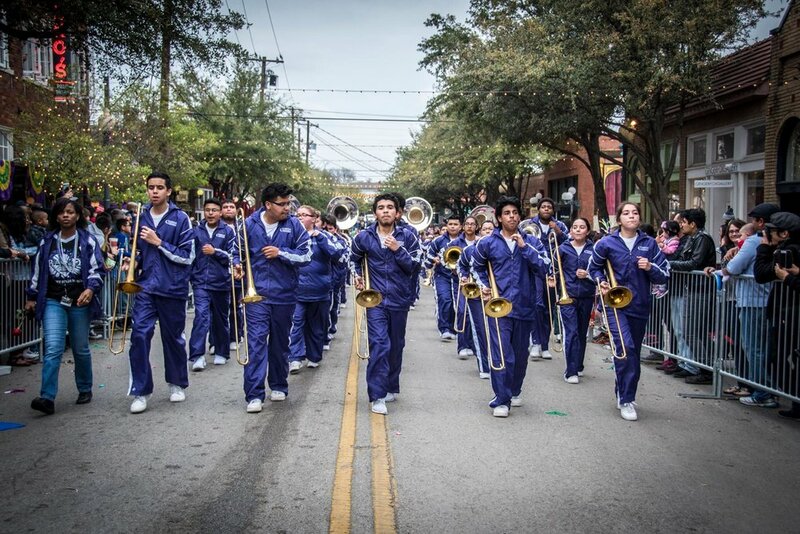 From schools and churches to service organizations and neighborhoods, on over to brass bands and New Orleans flare, a representation from every facet of Oak Cliff and New Orleans are welcome and included in the Mardi Gras Oak Cliff Parade! 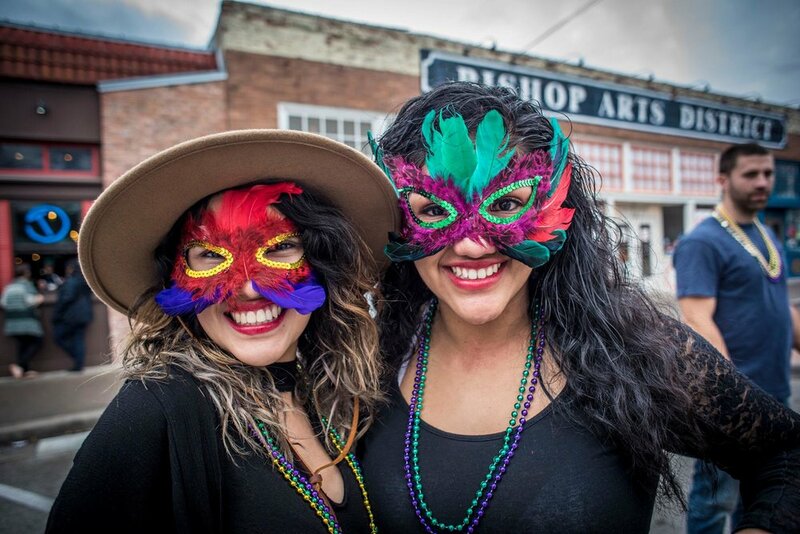 This year’s parade will be anchored by a block party in Bishop Arts, beginning at 2:00 p.m.
See the block party event details here. Coming off a well-attended Election Night Street Party, the business owners and residents around the Bishop Arts District asked, “What’s next?” The community threw their hearts and creativity into it, and a parade was born. The first year featured 27 entries, and the crowd was approximated to be 2,000 people. Now the parade caps at 50 entries who get better and better every year, and crowd estimates are in the 10,000 range! 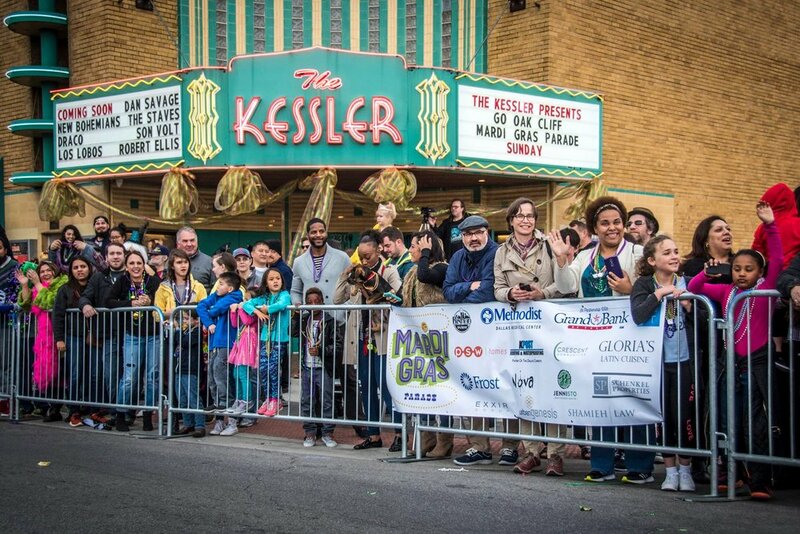 The purpose of the parade is still the same: To bring community members together, and to introduce new people to the awesome Oak Cliff community.